When I picked up the mangos on the weekend I remembered having seen some recipes for fish with mango salsa that sounded simple and good. I made sure to stop by the fish monger and I decided to try a new fish that I had been wanting to try for a while, sea bass. From what I could gather sea bass was a white fish similar to halibut and I thought that it would work with a mango salsa. 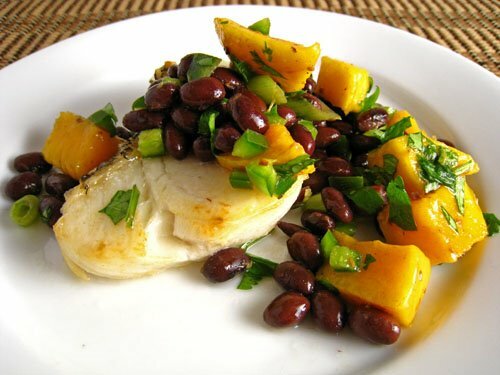 Searching through my bookmarks I found a recipe for roasted tilapia with mango and black bean salsa . The black bean and mango salsa sounded fresh, healthy and tasty. This meal was really really easy to make. You just bake some fish and chop some mangos and peppers. What’s more is that it was really good! The sea bass was pretty similar to halibut and it was nice and moist and tender and flaky. The salsa was an amazing combination of sweet and hot and the black beans added a nice creaminess. I flaked the leftover sea bass and used it and the leftover salsa to make fish tacos. Lightly oil you broiler pan to prevent the fish from sticking. Season the sea bass with the salt and pepper. Bake the sea bass in a preheated 450F/230C oven until cooked (no longer opaque), about 10-15 minutes depending on how thick the sea bass is. And now on to the mango kick! That looks great. I’ve always been a fan of fruit-based salsas on seafood. mango & black beans is one of those combinations that seems odd at first, but is really a match made in heaven – yum! I’ve been trying to cook fish more often and get pretty bored with my dishes. This looks like such a refreshing and easy combination. That looks delicious! Light, fresh & simple. Nice job Kevin. This dish looks like something I’d be served in a Carribean resort…catch of the day! Delicious! I love fresh mango salsa with fish! yummy! I vote for tacos! Were they as good as the original dish? What a light and lovely dish! It looks absolutely delicious! Yumm I love mango salsa’s. Looks like a great warm weather dish. You are my number on inspiration in cooking right now. Thank you for real food, how to cook it, making it sound easy…which it mostly is, and for being creative with food. Props, dude! oh this is so fabulous..seeing all those mango recipes 🙂 i love the idea of mango and black beans. the mango salsa with fish is also brilliant!! That looks decidedly delicious Kevin! I love all the ingredients. Shall have to pick myself up some sea bass at the fish mongers soon! who needs the fish when that salsa is waiting in the wings? i sure don’t! looks absolutely scrumptious! The colors on this plate are gorgeous, Kevin. Really nice job! joy to the world for mangoes! I make a salad just like this on my site, except I add red peppers and corn for more color! This looks delicious and oh so summery. What a summery looking plate of food, Kevin. It is just bursting with colors. Mango and black bean salsa sounds wonderful with the delicate flavor of the sea bass…and I love how the mango looks a little bigger than what I see on many recipes. Mango is so distinct and different from the black bean, so the contrast is really nice. This looks like a dish that belongs in a 5 star restaurant. Just beautiful and great job Kevin! I love mango + black bean dishes. So delicious! oooh, that mango salsa looks fantastic! mmmm! I’ve never thought to pair mango and black beans but now I think about it it sounds pretty good; and this meal looks delicious. I’m such a fan of fish! You’ve gone and done it again Kevin!! I WANT to eat that NOW!!! Looks really lovely. I have a mango here that I was wondering what to do with….Thanks for the recipe. The photo looks great and I love all of the color. Sounds like it would be a tasty dish. All that’s missing is a margarita! Looks delicious! I love sea bass, but we hardly ever get it here. Gosh that looks good! I’m not a big fish fan, but I’d happily eat this. Good job! I love how you continue to use ingredients in subsequent posts. This looks beautiful Kev! Awesome! I love fish and fruit and this dish is perfect! Looks great! And really colorful! Visiting for the first time and I must say, I enjoy your fresh approach w. cooking but still looks like a hearty meal! look forward to reading+seeing more. I love mangoes and fish together, this looks delicious! Yikes…sea bass is my favourite white fish and it’s so velvety delicious. Too bad it’s so expensive! Your dish turned out beautiful! Great colours! What a fabulous looking dish, great use of mangos!